Aneurysm, Aortic Dissection , Atrial Myxoma, Coronary Artery Bypass Grafting (CABG), Off-Pump/ Beating Heart Surgery, Pulmonary Embolism, Valve Repair / Replacement, Valvular Heart Disease. Associate Professor Kenny Sin is Deputy Medical Director and Senior Consultant, Department of Cardiothoracic Surgery, at the National Heart Centre Singapore (NHCS). He is also Chairman for Healthcare Performance Office of NHCS, Academic Vice Chair, Clinical Services in the Cardiovascular Sciences Academic Clinical Programme, and the current President of the ASEAN Federation of Cardiology since 2012. Assoc Prof Sin graduated with his Bachelor of Medicine and Surgery from the National University of Singapore (NUS) in 1989. He did his fellowships at the Oxford Heart Centre, John Radcliffe Hospital, UK from 1998-2000 and at the University of Texas-Houston, Memorial Hermann Hospital, USA from 2000-2001. 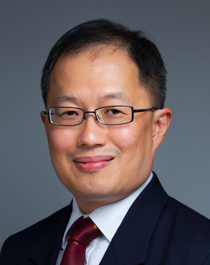 He is Clinical Associate Professor with the NUS Yong Loo Lin School of Medicine, and Adjunct Associate Professor with Duke-NUS Medical School. He is also a part-time academic staff with the Faculty of Medicine at NUS and Nanyang Polytechnic, Singapore. Assoc Prof Sin is a Fellow of the Royal College of Surgeons, Edinburgh, UK, since 1993 and Fellow of the Academy of Medicine, Singapore, since 2001. He has co-authored numerous papers, abstracts and participated in various research projects and clinical trials. Assoc Prof Sin performs adult cardiac surgery, including Coronary Artery Bypass, Valve Replacement and Repair. His sub-specialty interest is in Aortic Aneurysm Surgery, which includes complex open reconstruction of the aorta as well as minimally invasive endovascular stent graft surgery. Outstanding Clinician Award (Special Mention), SingHealth GCEO Excellence Award 2013. PS21 ExCel Award 2013, Innovative Champion category – Silver. Atrial, Ventricular, and Atrioventricular Septal Defects. Ravi Pillai and Kenny Sin. In: Morris PJ, Wood WC, eds. Oxford Textbook of Surgery Second Edition: Oxford University Press, 2000;2245-2249. Abnormalities of the Atrioventricular Valves. Ravi Pillai and Kenny Sin. In: Morris PJ, Wood WC, eds. Oxford Textbook of Surgery Second Edition: Oxford University Press, 2000;2263-2266. Surgical Management of Infective Endocarditis. YK Sin, YS Tan, S Shankar, YL Chua. Asian Cardiovasc Thorac Ann 2000;8:241-244. Iatrogenic Aortic Dissection Complicating Cardiac Surgery. YK Sin, S Shankar. Asian Cardiovasc Thorac Ann 2000;8:361-363. The Ultracor Tilting Disc Valve in the Aortic Position: Mid-Term Follow Up. Sin YK, Karen Campbell, Pillai R. J Heart Valve Disease 2000;9:688-692. Valve-Sparing Aortic Root Replacement. Sin YK, Pillai R. J Card Surg 2000;15(6):424-427. Aortic Surgery in Asia. CN Lee, YK Sin. Semin Thorac Cardiovasc Surg 2002;14(4):354-357. Ruptured Mycotic Descending Thoracic Aortic Aneurysm: Lower Lobectomy and Interposition Dacron Graft Repair. YK Sin, YL Chua. Asian Cardiovasc Thorac Ann 2003;11:77-9. Deep Hypothermic Circulatory Arrest in Adults Undergoing Aortic Surgery: Local Experience. Chong SY, Chow MY, Kang DS, Sin YK, Sim EK, Ti LK. Ann Acad Med Singapore 2004;33(3):289-293. Cogan’s Syndrome with Recurrent Carotid and Aortic Aneurysms: A Potentially Fatal Disorder Mimicking Marfan Syndrome. AHL Low, JW Su, KYK Sin, KY Fong, J Thumboo. Scand J Rheumatol 2007;36:71–73. L-type Calcium Channel α-1C Subunit Mutation Is Not Present In Atria From Cardiac. Surgery Patients With Atrial Fibrillation. Jia-Lin Soon, Liao Ping, Yeow-Leng Chua, Tuck-Wah Soong, Kenny Sin Yoong-Kong. Revised manuscript accepted for publication in the Asian Cardiovascular and Thoracic Annals. How should I treat a percutaneous transcatheter mitral paravalvular leak closure? Chiam PT, Ding ZP, Sin YK, See Tho VY, Chua YL, Gunasegaran K, Jeinin V, Ruiz CE. EuroIntervention 2010 Nov; 6(5): 653-9. dol:10.4244/EIJV615A108. Percutaneous mitral valve repair with the MitraClip for severe mitral regurgitation – First case in Asia. Yeo KK, Ding ZP, Chua YL, Koh TH, Sin YK, Lim ST, Jack WC Tan, Paul TL Chiam & Hwang NC. Singapore Medical Journal – Case report. A survivor of late prosthesis migration and rotation following percutaneous transcatheter aortic valve implantation. Philip YK Pang, Paul TL Chiam, Victor TT Chao, Tian Hai Koh, Yeow Leng Chua, Yoong Kong Sin. European Journal of Cardio-Thoracic Surgery 0 (2012) 1-2 doi:10.1093/ejcts/ezr195. Iliofemoral Anatomy Among Asians: Implications For Transcatheter Aortic Valve Implantation. Chiam PT, Koh AS, Ewe SH, Sin YK, Chao VT, Ng CK, Lee CY, Lim YP, Su JW, Lim SL, Tan TE, Lim CH, Tan SY, Chua TS, Koh TH, Chua YL. International Journal of Cardiology April 2012 (online). International Journal of Cardiology 2013, Aug 20. Absence of Calcium Channel α-1C Subunit Mutation In Human Atrial Fibrillation. Jia-Lin Soon, Liao Ping, Yeow-Leng Chua, Tuck-Wah Soong, Kenny Sin Yoong-Kong. Asian Cardiovasc Thorac Ann. Aug 2010; 18(4): 349-53. Percutaneous mitral valve repair with MitraClip for severe functional mitral regurgitation. Khung Keong Yeo, Zee Pin Ding, Yeow Leng Chua, Soo Teik Lim, Kenny Yoong Kong Sin, Jack Wei Chieh Tan, Paul Toon Lim Chiam, Hian Chih Hwang, Tian Hai Koh. Singapore Medical Journal 2013; 54(1): e9. (Case Report). iPSC-derived human mesenchymal stem cells improve myocardial strain of infarcted myocardium. Miao Q, Shim W, Tee N, Lim SY, Chung YY, Ja KP, Ooi TH, Tan G, Kong G, Wei H, Lim CH, Sin YK, Wong P. J Cell Mol Med. 2014 Aug;18(8):1644-54. doi: 10.1111/jcmm.12351. Epub 2014 Jun 28. Is it possible to predict the risk of ischaemic bowel after cardiac surgery? Yap KH, Chua KC, Lim SL, Sin YK. Interact Cardiovasc Thorac Surg. 2014 Sep;19(3):494-8. doi: 10.1093/icvts/ivu145. Epub 2014 Jun 4. Therapeutic hypothermia in adult patients receiving extracorporeal life support: early results of a randomized controlled study. Pang PY, Wee GH, Hoo AE, Tahir Sheriff IM, Lim SL, Tan TE, Loh YJ, Kerk KL, Sin YK, Lim CH. J Cardiothorac Surg. 2016;11(1):43. Published in the Journal of Cardiothoracic Surgery on 5 Apr 2016. Surgical management of very late paravalvular leaks after mitral valve replacement: a single institutional experience. Pang PY, Zhu J, Sin YK, Chua YL. Journal of Thoracic Disease, J Thorac Dis 2016. doi: 10.21037/jtd.2016.08.58. [Epub ahead of print]. Comparison of the Haemodynamic Parameters of Venous and Arterial Coronary Artery Bypass Conduits. Soon Jia Lin, Kenny Sin, Victor Chao, Tan Teing Ee, Mathew Jose Chakaramakkil, Chua Yeow Leng, Kang Ning. Published in Annals of Academy Medicine Singapore, August 2016, Vol 45 No 8. Superior Mesenteric Arterial Stenting For Ischaemia Following Acute Type B Aortic Dissection. Singapore Medical Journal (Submitted). Foo CC, Sin YK, Htoo MM, Lim CH. Aortic Trauma. YK Sin, YL Chua. In: Hwang NC, Ooi LC, eds. Acute Surgical Management: World Scientific Publishing, 2004;200-211. Implementation of a versatile extracorporeal life support cart and a simplified workflow in reducing interhospital activation. Hoo Anne,Maggie Cheah BK, Tan TE, Sin YK. Poster Presentation at ELSO-EURO 2012. RE-COVER II (CIRB Ref: 2008/018/C) A phase III, randomized, double-blind, parallel-group study of the efficacy and safety of oral dabigatran etexilate (150mg bid) compared to warfarin (INR 2.0-3.0) for 6 months treatment of acute symptomatic venous thromboembolism, following initial treatment for at least 5 days with a parenteral anticoagulant approved for this indication. (Principal Investigator) completed. Hokusai VTE: A Phase 3, Randomized, Double-blind, Double-dummy, Parallel-Group, Multi-Center,Multi-National study for evaluation of efficacy and safety of (LMW) Heparin/Edoxaban Versus (LWM) Heparin/Warfarin in subjects with symptomatic deep-vein thrombosis and/or pulmonary embolism. (Principal Investigator) completed. Prognostic factors in patients requiring Extracoporeal Membrane Oxygenation (ECMO) support. (CIRB Ref: 2011/144/C) (Principal Investigator) ongoing. Point-of-Care Testing: Validating CoaguChek XS in patients post-open heart surgery. 2013/758/C - completed. PI: Kenny YK Sin. Co-I: Hide Elfrida Wee, Kenneth Guo, Hon Jin Shing, Teo Siew Chong, Shera Wong See Ah, Pasty Chiang & Yap Yen Ping. A prospective study comparing steri-strip with suture in closure of post central chest tube removal incision wounds. 2014/518/C PI: Kenny YK Sin. Co-I: Dr Meynard and Zhang Xiaoxia (CTS specialty nurse) from W56. Sorin Group Real Life Registry – Mitroflow Aortic Pericardial Heart Valve. Principal investigator: Dr Soon Jia Lin. Co-Investigator: Sin Yoong Kong, Chua Yeow Leng, Lim Chong Hee, Lim See Lim, Tan Teing Ee, Lim Yeong Phang, Victor Chao, Su Jang Wen. Ongoing. A retrospective survival analysis of long term outcomes after coronary artery bypass grafting. PI: Kenny YK Sin. Retrospective review of catheter directed pulmonary thrombolysis from 2000 to 2011 performed at SGH. PI: Dr Farah, SGH. Co-Investigator: Kenny YK Sin. Closed.